"It's simple. Don't start nothin', won't be nothin'. Start something... and pay the price. And don't mess with my Razor Back. You do, you WILL, die." Heightened Senses: Like many animals, Ionels sense of sight, smell, hearing, and taste have been enhanced. Through her Tzimisce abilities, Razor Back has made it so that Ionels eyes cannot only see in extremely low lighting, but also can see heat sihlouettes like many snakes can. His hearing rivals that of any animal, allowing him to focus on a sound in the nosiest of rooms. His sense of smell enables him to track, identify, or find an individual before they are within sight. Ionels enhanced taste enables him to tell multiple items or foods apart at a time, and is sensitive enough to decern weither or not something is poisonous. Skeletal Structure: Most human bone break rather easily when force is applied. After several broken legs from his continual bouncing about, Razor Back has fortified and strenghtened his bones, increasing its over all density. As a result, Ionels bones are extremely hard to break, being able to take direct hits from swords and maces and hardly noticing it. Muscle Structure: Ionel loves to run, jump, climb... basically do anything physical. After several encounters with some nasty individuals, and several broken bones and dislocations, Razor Back reworked his musculature, making him 3 to 4 times stronger than your average man. This increase in muscle density has also allowed Ionel to be more resilient to damage, as his muscles are tightly packed together. Tendons: To compliment his increased bone density and muscle strength, the tendons in Ionels body have been strengthened and tightened as well, allowing his reflexes to react and move at an instinctual level, faster than cognitive thought. Its pretty tough to lay a hand on him now. With the change in both his muscle and tendon structure, Ionel is extremely agile and athletic, putting him in a class that surpasses any Olympian in both speed, strenght, and gymnastic/acrobatic abilities. Jaws: Thanks to the reworking of muscles and tendons, not to mention his jaw being broken, Ionel now has a bite force that reaches a total of 3,000 psi! To add to this, the teeth in his mouth has been changed into razor sharp points, each tooth having micro-serations that makes a sharks tooth look dull. Hands: The bones of each hand have been grown out into sharp points with razorsharp serrated edges. His middle finger and ring finger have been fused together, the skin stripped. These fused bones have been reworked into a long dagger like shape, the underside a blade of sorts,and the ends of which are slightly hooked. Legs: After having his knees reversed and his legs reshaped, Ionels legs are more like that of a cat, allowing him to jump higher and farther. His feel have been reshaped, each of three main toes having a razor sharp talon. The entire bone structure of his inner toes have been reconfigured to that of a large raptor claw. Be it for grip, defense, or attack, they are a tool tested by time itself, just ask the dinosaurs! Back Spines: Fused into his spine, Ionel has a series of Bone spikes protruding out. These spikes like the rest of his body are razor sharp, offering both protection, and a possible weapon. 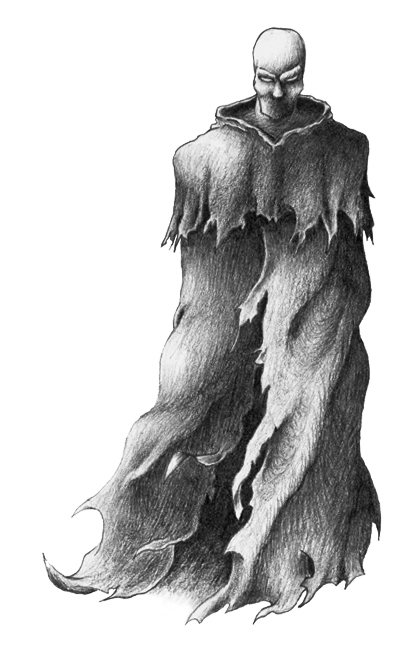 1 • Cloak of Shadows- The vampire may be unnoticed by most, by hiding completely motionless in a shadow, or in a place that puts an object (not necessarily an object big enough to hide behind) between himself and others who might see him. 2 • Unseen Presence- The vampire may go unseen, and even be subconsciously avoided, by others. No roll is required unless someone is looking for the vampire, or the vampire is moving in an abrupt manner, as during speech or combat. 1 • Heightened Senses- The vampire can sharpen any or all of her senses, at will, for as long as he wants. However, traumas caused by sensory overload (IE very bright lights, loud noises, etc) while in this state last much longer. How this comes into play is decided by the Storyteller, who may describe details more fully. The vampire will also sense things that he would otherwise not sense, that might be important. How this danger sense is used is up to Storyteller whim. 1 • Endurance- While most Kindred still suffer the fatigue and pain of their injuries, you shrug off such hardships. Even the searing injuries of fire and sunlight can barely slow you. Thus, the types of injuries that you would receive from attacks are greatly reduced once inflicted. For example, if your attacker sliced at you with his/her sword in a severe manner, the damage would, usually, be a severe and deep wound. With the discipline activated, your damage would be reduced to that of a small slice or gash in your skin. 2 • Mettle- Wounds that would slow other Vampires means nothing to him. He can shrug off damage from most sources, ignoring pain and damage alike. Your body resists harm with incredible strength. Simply means that any damage inflicted upon him still hits, but the impact of the damage is greatly reduced. 3 • Resilience- Even the banes of most Vampires, fire and sunlight, rarely injure you. He can endure punishment that would reduce other Vampires to ashes...although only for a brief time. This discipline will only help on two separate instances only: 1. If he is about to enter sunlight 2. Set aflame. He can invoke Resilience to withstand the deadly effects of the sun and fire. The "preventative effects" against the sun and fire only last for a short time. 4 • Personal Armor- Nobody like to get hit (or shot, or stabbed for that matter), not even Cainites. The easiest way to ensure that one is not hit (or shot, or stabbed) repeatedly is to take the weapon with which one is assaulted away from one's attacker and break it. That's where Personal Armor comes in. This discipline causes anything that strikes the Kindred who employs Personal Armor to shatter on impact. The Vampire still takes the damage inflicted, regardless if the weapon shattered on impact or not. A hand-to-hand attack causes the attacker an equal amount of damage by the defender when Personal Armor comes into play. 5 • Shared Strength- It's one thing to laugh off bullets, rather another to watch the ricochets mow down everyone around you. Many Kindred have wished, at one time or another, that they could lend their monstrous vitality to those around them Those few Vampires who have mastered the discipline of Shared Strength, can - if only for a short time. A Vampire can never bestow more levels of Fortitude than the caster him/herself possess on another. 6 • Resistance- Your Vampiric Endurance far surpasses that of any mortal, or even other younger Cainites. You shrug off injury without noticeable effect. Blows that would stagger or kill a mortal barely scratch him. 1 • Prowess- He has unearthed a level of strength unusual even in Vampires. Where others would flag and fail, he redouble his efforts. His mighty blows land with a force that kills even the hardiest of mortals. With Prowess all of his unarmed or clubbing attacks inflict lethal damage instead of bashing damage, if he so desires. Using Prowess costs nothing and it does not count as an action; it may be done at any time. 2 • Might- His strength daunts even other Cainites. Few would dare to cross him in a test of physical power. He is far more likely than the average Vampire to succeed in challenges of strength. Might costs nothing to use. You may use Might even if his opponent attempts to evade his strength. His power is so startling that even an opponent who attempts to outlast him with stamina or to dodge him with quickness can be overcome, as long as he rely solely on his strength. Doing so generally requires him to bid a strength-related Trait, such az the types of Traits restorable with Prowess. He could use Might while trying to grab at a dodging opponent, but not when picking up and throwing a heavy object. 3 • Vigor- His Vampiric strength is truly monumental. He can heft hundreds of pounds with ease, deliver enough force to crush bones in a single blow and hammer down any opponent of lesser strength. Using Vigor costs nothing and his use of Vigor requires him to use only his strength. 4 • Intensity- His titanic strength never fails him. Unless sorely pressed or wounded, he can continue incredible feats indefinitely. Whenever he enters a challenge of strength, he may use Potence as his bid Trait. 5 • Imprint- A Vampire with extensive knowledge of Potence can squeeze very, very hard. As a matter of fact, they can squeeze (or press, or push) so hard that they can leave an imprint of their fingers or hand in any hard surface up to and including solid steel. A use of Imprint can simply serve as a threat, or it can be used, for example, to dig handholds into sheer surfaces for purposes of climbing. 6 • Feral Whispers- According to some, Potence is merely the art of hitting something very, very hard. But what do you do when your target is too far away to hit directly? The answer is, if you are efficiently talented with Potence is to employ Earthshock. Simply...Earthshock is the ability to hit the ground at point A, and subsequently have the force of the blow emerge from the ground at point B, some distance away. 7 • Puissance- No mortal can match you, and even Vampires tremble at your touch. The strength of your dead limbs is truly monumental, crushing anything that stands before you. Furthermore, your incredible strikes inflict an additional health level of damage in combat. This bonus applies to any attack in which your strength is a factor---unarmed combat or combat with melee weapons. However, use of this incredible strength almost certainly breaks weapons that are not specially designed to stand it. 8 • Flick- It is said that, "the great ones always make it look easy". In the case of Flick, that saying stops being a truism and become the literal truth. With this discipline, a master of Potence can make the slightest gesture - a wave, a snap of the fingers, the toss of a ball - and have it unleash the full devastating impact of a dead-on strike. 1 • Gleam of Red Eyes- The vampire may see in the dark. When he is using this power, his eyes glow red. This change takes one turn to complete. 2 • Feral Claws- By spending one blood point, the vampire may grow one-inch claws on his fingers, which do aggravated damage. This change takes one turn to complete. 3 • Earth Meld- By spending one blood point, the vampire may sink into the ground, gaining shelter from sunlight. This only works on earth; this power may not be used on concrete, asphalt, or even earth under a linoleum floor. 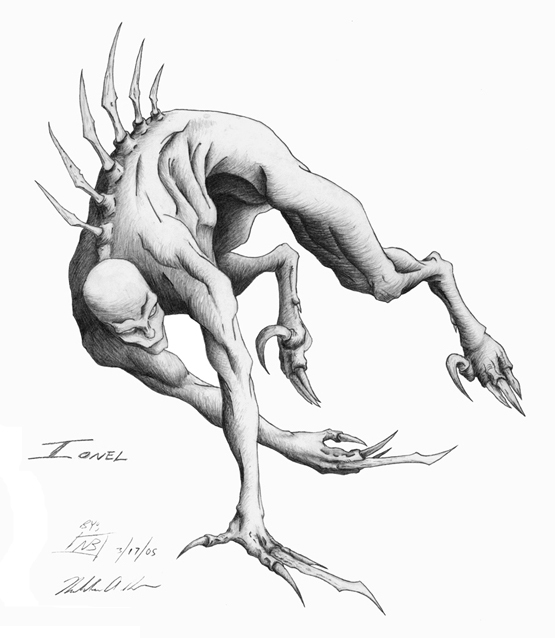 4 • Shadow of the Beast- By spending one blood point over three turns, the vampire can transform into a wolf or a bat. This may also be done by spending three blood over one turn, if the vampire’s generation allows it. 5 • Form of Mist- By spending one blood point over three turns, the vampire can transform into a mist. This mist may not be separated by wind, but it can be moved by it, and Potence must be used to resist being blown around. This may also be done by spending three blood over one turn, if the vampire’s generation allows it. 6 • Adaptibility- The vampire may survive and function in a particular extreme environment, such as extreme cold, underwater, etc. The environment in which the vampire may exist is chosen when he learns this power, and may not subsequently be changed. 6 • Flesh of Marble- The vampire’s skin, while retaining its usual flexibility, is as hard as stone, and he will take only half-damage (round down) from everything except fire and sunlight. 6 • Earth Control- The vampire may move around in the earth, as if swimming in it. Chases under earth may be resolved by both parties making Strength + Athletics rolls. 7 • Homunculus- By pulling some flesh from the back of his mouth, the vampire may summon a three-inch-tall copy of himself, which has a personality that is a warped version of his own. This creature lacks disciplines, will die if it runs out of blood or suffers two levels of aggravated wounds, burns one blood point per hour, and may hold three blood points at a time. 7 • Form of the Ghost- By spending a blood point, the vampire can become insubstantial. The vampire’s appearance doesn’t change, he can move as if real, he is not affected by gravity or wind, and he may pass through solid objects. 8 • Movement of the Slow Body- The vampire may move at an inch per minute, even if he is staked, or would otherwise be unable to move. 9 • Dual Form- The vampire may split into two weaker versions of herself, unless one of his attributes is at zero. For each new replicant, all attributes are reduced by one, and blood pool and the amount of blood that can be spent are each halved. Unless the character has the appropriate Auspex powers, there is no communication between them beyond intuition. The two characters may reunite by touching, but this is quite nauseating for others to watch. 10 • Body of the Sun- The vampire may turn into a nearly invulnerable fireball, and may remain in this state by spending two blood points per turn. If a target is touched by it, he takes aggravated damage. If a vampire looks at the vampire for more than one turn, they will be blinded for one hour. The vampire is invulnerable to all physical attack, and sunlight will only hurt him if his Stamina is low. 1 • Changeling Roll- By spending a blood point, the vampire may change one of his physical features -- anything from the size of his nose, to an animal feature, to his eye color. The difficulty to use this power to raise Appearance is 10, and a botch reduces the trait. Roll: Intelligence + Disguise, difficulty 10 By spending a blood point, the vampire may physically alter her flesh look like someone else, with results as follows: 1 suc. He looks a little like the target. 2 suc. He could fool anyone who doesn’t know the target. 3 suc. He looks reasonably like the target. Most people won’t notice there is one small deviation or two. 4 suc. He’s close. Damn close. 5 suc. He could fool even family or close friends. 2 • Fleshcraft Roll- By spending a blood point, the vampire may make more drastic changes in her own flesh, or that of another. (An unwilling victim must first be subdued.) If used to disfigure a victim, reduce Appearance by one for each success. 3 • Bonecraft Roll- By spending a blood point, the vampire may make very drastic changes in his own bone structure, or that of another. (An unwilling victim must first be subdued.) If used to disfigure a victim, reduce Appearance by one for each success. If used without Fleshcraft, with the intent of injury, the victim takes one die of damage for each success. 4 • Horrid Form- By spending two blood points, the vampire may transform into a horrible monster. This form is about eight feet tall and muscular, with six to eight fingers on each hand, and has black pus in place of skin. In this form, the vampire’s hand damage is increased by one, her physical traits are each increased by three, and her social traits are each reduced to zero. 5 • Inner Essence- The vampire may convert his body parts to blood, which may later be used to reform the body part in question; other than the head, the body part may also be regenerated. The upper torso and legs are each worth two blood points; the arms, lower torso, and head are each worth one blood point. 6 • Body Arsenal- The vampire may create non-projectile melee weapons from his flesh -- all of which do aggravated damage. 6 • Plasmic Form- The vampire may transform himself into a sentient fluid, capable of movement, and holding any shape. This grants immunity to physical attack, but makes actions requiring eye contact or a physical body impossible. 7 • Flesh Rot Roll- At a touch, the vampire can inflict a degenerative disease on a victim that resembles leprosy. Each success is another day that the disease remains, carrying further effects. All changes to attributes made by this disease are permanent; the victim is also considered to be horribly disfigured for the entire time he is affected. 1 suc. Day 1: the victim loses one Stamina. 2 suc. Day 2: the victim loses one Stamina. 3 suc. Day 3: the victim loses one Strength, one Stamina, and one health level. 4 suc. Day 4: the victim loses one Strength, one Dexterity, and one health level. 5 suc. Day 5: the victim loses one health level. 8 • Breath of the Dragon Roll- The vampire may exhale flames. Each time the vampire hits something, a die is rolled to determine coverage, and that many dice of aggravated damage are inflicted every turn until the flames are extinguished. 9 • Doppelgänger- The vampire may assume any shape, from half his mass to double his mass, by spending one blood point. He retains his weaknesses (such as vulnerability to sunlight) in this form. 9 • Meld- with the Land The vampire may enter the earth, becoming invulnerable to any force that doesn’t destroy his section of earth. The subject is aware of all that occurs above him, but can not see or hear. This power may even be used in torpor. 10 • Reform Body- The vampire’s body reforms, even after he is destroyed. Yes, you read that right. He will live forever... like it or not. 1 • Thread of Chaos- This is a small but ingenious little ability Teldicia had when she saw a spider weave its web. The actual power itself weaves many black strands of unknown material around a person, catching them and making them think skewed from thier normal thinking..(say someone who was good and just may begin to think unjust and impure thoughts, a reversal of what one is for the most part) This power works easily on mortals, and can affect Cainites as well, if the vampire is strong enough. 2 • Kiss of the Void- this power is done by putting one's own blood onto the lips and kissing the intended victim. That person is then wrapped in the sweetest ecstacy..for a full day thinking of nothing but the one who kissed him/her. However, as this goes on, day by day, the perception of the kisser becomes distorted, and eventually, the person is plagued with nightmares, instead of pleasant dreams, then it switches again, and so on..until dream and nightmare is one, and the person is a gibbering wreck, held in the arms of a chaotic mind. This is most effective (So Teldicia loved to demonstrate) on Tremere and Cappdocian, the odd point of this a high mental attribute makes you *weaker* against it, not stronger. 3 • Chaotic Sun- This is a truly insidious power, it affects the nature of effect on the mind's eye. A distortion is caused on the Cainite that is the victim, making Him think that twilight is dawn, and vice versa. In essence, He will get up and walk around in the day, and thus, die. Because his mind sees it as night and not day, this has been the death of many a cainite, however, it will not affect those with the strongest minds, and must be done on a generation, if not weaker, at least within one or two generational numbers. 4 • Web of Deception- This is one of Teldicia's favorite powers, the ability to warp perceptions of others in an area. A spiderweb symbol appears on the forehead of the victims. This can be done at a distance. Those successfully affected see things ina chaotic way, friends become enemies, things that are not real happen, and the truth is always a lie to them. They are constantly at odds with their nature, and they in essence become the opposite of what they are, more so than Threads of Chaos. (i.e, a vampire goes to His clan Sire for advice, but is hit with the Web before He gets there. He then would see instead of His clan Sire in front of Him, His greatest Nemesis, and no matter what His Sire said, He would hear only the lies that the web weaves) This can affect any Cainites and mortals in a 20' circular radius. This has the same generational limitation as Chaotic Sun. 5 • Chaos Orb- This is a unique offensive ability, that is the same as Web of Deception, but is hurled in an explosive black orb. The only difference is that whereas the Web is permanent until removed, the Orb is temporary and affects 100' radius except the user..this is generally used for amusement, or a quick getaway, as allies become foes and family members become blood enemies..Many times Teldicia had a laugh using this technique from afar. It is usually ten minutes before this wears off, and by then, the damage has been done. 6 • Double- This chaotic power distorts general reality, making it possible for the vampire to use two disciplines at once, in a single action instead of one, on the turn of battle after Double is used. Many times Teldicia had used this, then two powerful attack techniques to down a foe most thought undownable. A powerful ability indeed. 7 • Triple- Effectively the same as double, but allowing for three. Not many can withstand such a power, and for this more than most, Teldicia was a very feared Fourth Generation Cainite.